Charles Moss Duke, Jr., 1935–. American astronaut. 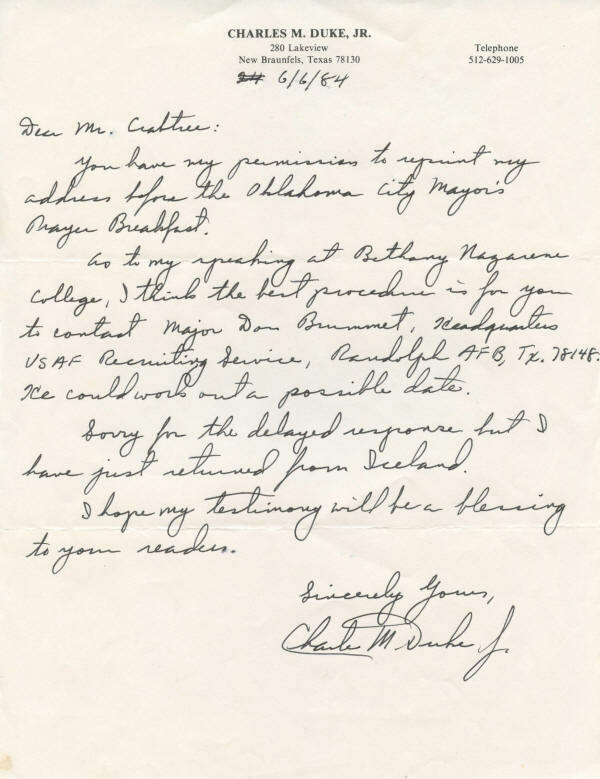 Autograph Letter Signed, Charles M. Duke, Jr., one page, 8½" x 11", on personal stationery, New Braunfels, Texas, June 6, 1984. Duke's handwritten letters appear to be rare. We have found only three in auction records over the last 37 years. In this letter, Duke, the tenth man to walk on on the moon, makes arrangements to speak at Bethany Nazarene College. He writes, in part: "You have my permission to reprint my address before the Oklahoma City Mayor's Prayer Breakfast. / As to my speaking at Bethany Nazarene College, I think the best procedure is for you to contact Major Don Brummet . . . . He could work out a possible date. / . . . I hope my testimony will be a blessing to your readers." A North Carolina native, Duke was one of the 19 astronauts selected for NASA's astronaut program in April 1966. He gained notoriety as the capsule communicator, or Capcom, the voice of Mission Control, for the first landing on Apollo 11. After the lunar module Eagle nearly ran out of fuel before Commander Neil Armstrong overrode the computer and finally landed it in a smooth area with only a few seconds of fuel left, an exasperated Duke radioed Armstrong, "You got a bunch of guys about to turn blue. We're breathing again. Thanks a lot!" In April 1972, Duke, as the lunar module pilot, and Commander John W. Young landed in the Descartes region of the moon on Apollo 16. They spent more than 71 hours on the moon and, in three excursions outside the lunar module, explored the lunar surface itself for than 20 hours apiece, driving the lunar rover some 16 miles and gathering nearly 213 pounds of rocks and soil samples. Duke, a brigadier general in the U.S. Air Force (Ret. ), is the youngest of the 12 men who walked on the moon in the Apollo program. He retired from NASA in 1975. Duke became a Christian after Apollo 16. He is a president of Charlie Duke Enterprises, Inc., and is an active speaker and Christian lay witness. He is a member of the Full Gospel Businessmen's Fellowship International, the Christian Businessmen's Committee, and the International Fellowship of Christian Businessmen. Duke has beautifully penned this letter in black ink. The letter has normal mailing folds and a small stain at the lower left border, well removed from the text and the signature. The letter is in fine to very fine condition.